2009 was the first year that I fully appreciated Thanksgiving. As a vegetarian, the whole eating Turkey thing has never inspired me to jump for joy. In addition, I often got sick on Thanksgiving which greatly limits the full enjoyment of a paid holiday (a rarity in the US). When I wasn't sick on Thanksgiving, I preferred to enjoy the long weekend with a trip to Europe. It was by default that I returned to the US for 2009 Thanksgiving. I needed a minor surgery for which I wasn't allowed to fly for 4-6 weeks after, so I decided to make that 4-6 weeks coincide with Thanksgiving and Christmas. I'm glad I did. Being home reminded me of the best parts of Thanksgiving: spending time with family and friends (Thanksgiving is one of the few US holidays where most US residents have time-off from work to partake in the holiday, eating good food (pizza and Mexican are perfectly suitable vegetarian Thanksgiving food), watching the Macy's parade and football (go Bronco's! ), and the day-after-Thanksgiving shopping specials (which have only gotten better with the invention of online shopping). Overall, it was great being home for Thanksgiving and getting to spend time with family and friends. It was especially nice to spend it with my nephew, who shipped to Afghanistan only 3 weeks later. He deserved a good send-off. 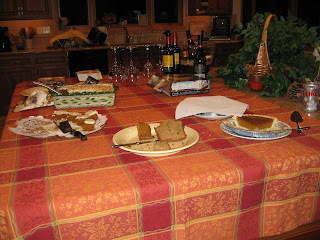 Pic: The "after" picture of the Thanksgiving dessert table.